Carson Dellosa Mark Twain Mat.. 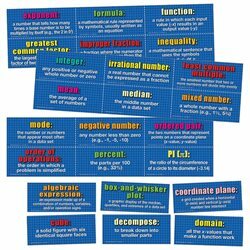 The eight board Mathematics Domain Specific Vocabulary Words Mini Bulletin Board Set features 48 mathematics vocabulary words with definitions that are die cut to be punched apart for use as study cards. They can also be displayed as a set. Each colorful card has a vocabulary word and a short, clear definition. Use the cards for review, vocabulary development, cooperative learning, word wall. Includes domain specific vocabulary words address the Mathematics Common Core State Standards.